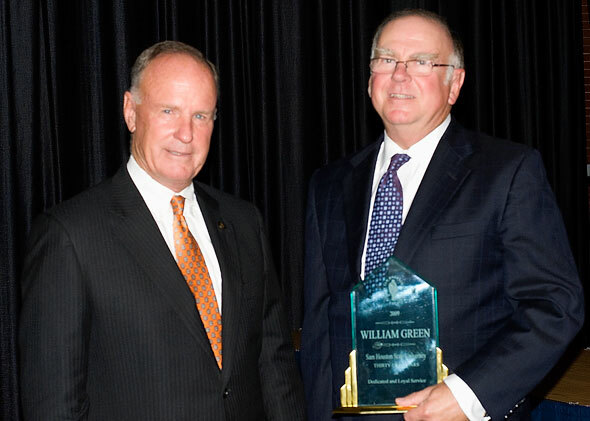 (Above) SHSU President Jim Gaertner (left) recognizes Bill Green, professor of economics, for his 35 years of service to the university. 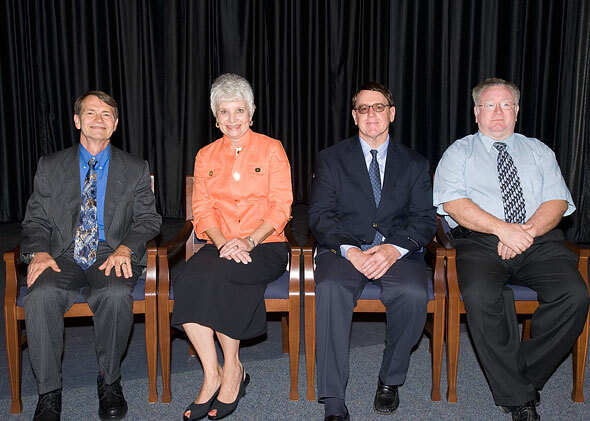 Thirty Year Service Award recipients: (from left) Terry Bilhartz, professor of history and chair, history; Ceclia Marquart, College of Criminal Justice; Frank Hoffmann, professor of library science; and Gary Roark, Lowman Student Center. 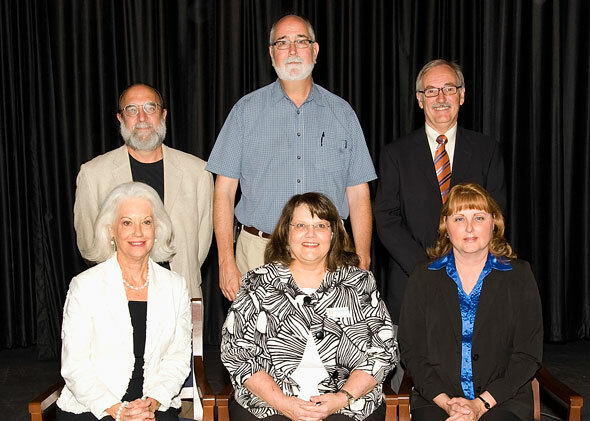 Twenty-five Year Service Award recipients (Group I): left to right (front row) - Genevieve Brown, dean, College of Education; Jacqueline Conrad, Newton Gresham Library; Terry Nixon, University Center; (back row) - Dennis Longmire, professor of criminal justice; Craig Schlicher, Distance Education; and Rick White, professor of chemistry. Not pictured: Dean Lewis, professor of marketing. 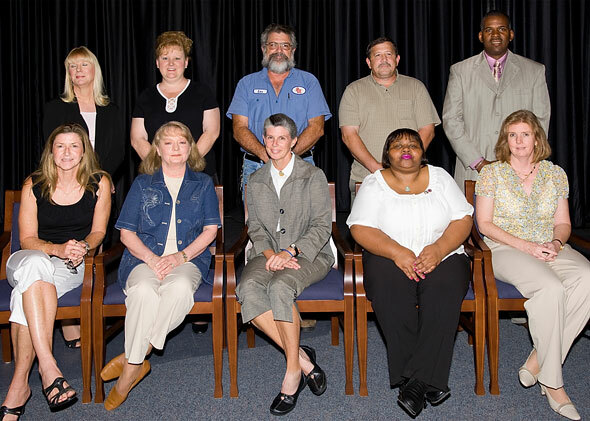 Twenty-five Year Service Award recipients (Group II): left to right (front row) - Brenda Gray, Athletics (head volleyball coach); Karen Andresky, Undergraduate Admissions; Chris Thompson, Athletics; Francis Davis, Physical Plant; Nina Cushman, Computer Services; (back row) - Janis Lawrence, Sam Houston Press; Norma O'Bannon, Travel; Lex Presley, Physical Plant; Dave Smith, Physcial Plant; Edgar Smith, Administrative Accounting. 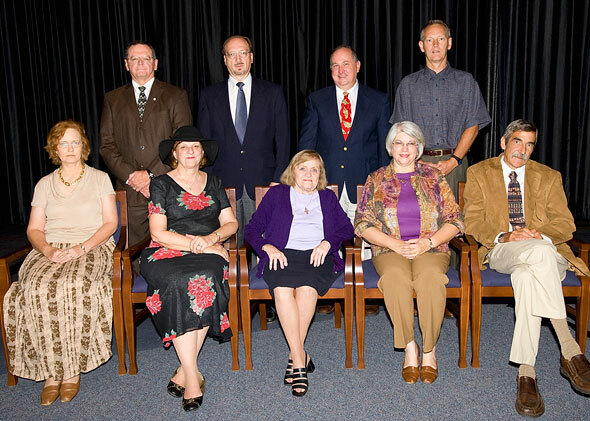 Twenty Year Service Award recipients (faculty): left to right (front row) - Diane Dowdey, associate professor of English; Darci Hill, associate professor of English; Kay Raymond, associate professor of Spanish; Janis White, assistant professor of fashion merchandising and design and chair, Family and Consumer Sciences; Chris Wilson, professor of psychology and chair, psychology; (back row) - Roger Abshire, professor of marketing and chair, management and marketing; Steven Cuvelier, associate professor of criminal justice; Patric Lawler, associate professor of art; Gary Oden, professor of kinesiology. 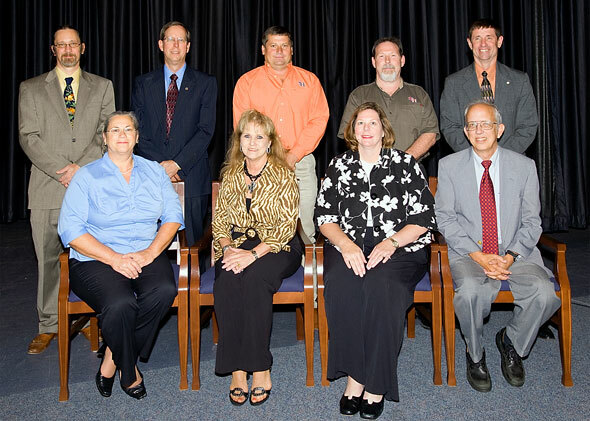 Twenty Year Service Award recipients (staff): left to right (front row) - Charlann Morris, College of Humanities and Social Sciences; Anita Shipman, Small Business Development Center; Joellen Tipton, Residence Life; Paul Ridings, Athletics; (back row) - David Epps, College of Criminal Justice; Charles McDowell, Sam Houston Press; Mike Yargo, Physical Plant; Jeff Vienneau, Residence Life; Keith Jenkins, Student Services. 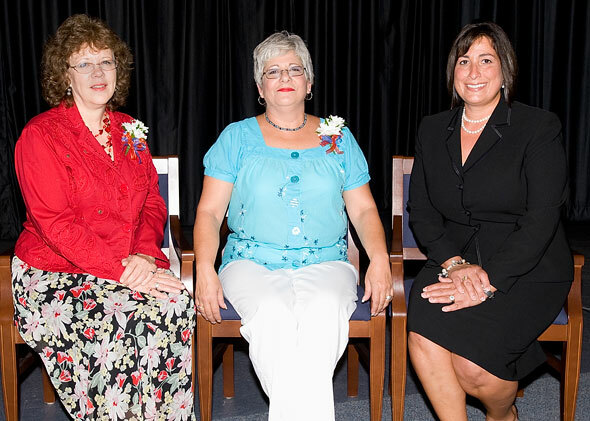 2009 Staff Excellence Award recipients (from left): Randi Clower, College of Education; Susan Hayes, College of Education; Evelyn Hasouris-Turner, College of Humanities and Social Sciences.